This contest is, by and large, interesting for two reasons. Firstly, this is the meeting between the sides most well-equipped to go on a memorable run from Group A. Burkina Faso’s stampede to the final last time around makes it controversial and unacceptable to categorise them as dark horses, but given their schedule – hypothetically, if they win Group A and go on a run they may have the advantage of a few days’ rest than opponents later in the tournament – and confidence, it wouldn’t be a stretch to consider them genuine contenders. The only reason they’re not more fancied, perhaps, is due to their unintimidating history in the competition. Secondly, the two teams have faced-off four times, during World Cup 2014 and AFCON 2015 qualifying, in the last 18 months and should be well acquainted with the other’s personnel and brand of football. Gabon are ahead on the recent head-to-head, winning both of the matches in Libreville and displaying commendable resilience in Ouagadougou to escape with a 1-1 draw in their last meeting. Burkina Faso boast the recent tournament pedigree, man-for-man strength and, with the regal and reliable recycling of the ball by captain Charles Kabore, should be on the front foot for much of the game. Gabon, in contrast, are most ominous when on the back foot. Their case as the tournament’s finest counter-attacking, quick-witted team in the run up to the tournament was presented and depicted in the slickness of their combination play in the malevolent area of central midfield and various turnovers deep in Burkina Faso’s half in Libreville, and the 13-second, five-touch breakaway equaliser in the draw in Ouagadougou. 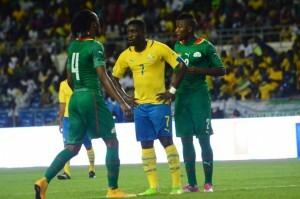 The key battle could be the showdown between Gabon forward Malick Evouna and Burkina Faso’s left-back Narcisse Bambara. Evouna, despite his unhandsome finishing, gave Burkina Faso’s whole backline, particularly Bambara, a torrid time in Libreville, flat out defeating his markers in footraces twice with his break-necking pace before squaring to Aubameyang for simple finishes in the 2-0 win. The Burkina Faso backline in general will need to be wary of balls over the top of their defence . A major feature of Gabon’s play in the aforementioned 2-0 loss, the Stallions were more vigilant in the subsequent meeting. Still, that heightened consciousness didn’t prevent a blistering breakaway that resulted in a goal by nemesis Evouna, anonymous until that point, in the 78th minute. Perhaps the unforgiving nature of tournament football will make these sides both cautious this time around, particularly Burkina Faso. Whatever the case, the victors in this match, if there are any, will accumulate huge impetus to go on a run. Burkina Faso Probable XI: Sanou; Koffi, Bakari Kone, Yago, Bambara; Djakaridja Kone, Kabore; Zongo, Alain Traore, Pitroipa; Aristide Bance. Gabon Probable XI: Ovono; Palun, Ecuele Manga, Musavu-King, Obiang; Bigoyo Poko, Ndong, Madinda; Bulot, Evouna, Aubameyang.